Yes! I have an F award from REP - KUL - TPE - HKG - NRT - LAX coming up in August. Including a 23 hr layover in each city. All for 67.5k miles! Yup, i've done it before, I've done, LAX-HKG-KUL-RGN. It's all in the same region (asia 2) - I dont think the agents care ( or know the geography) to figure out if you're semi-back tracking. The agents probably don't care, but the computer might. Two success stories, so I may as well try. Thanks! I'm looking to do US-southeast Asia in a couple of months. The most straightforward, and cheapest, option is obviously some combination of AA/CX/JL across the Pacific and CX/JL onwards. More expensive is using two awards via Europe or the Middle East. I'm familiar with the free date and routing changes for awards. What about when multiple awards are redeemed for a one-way trip? 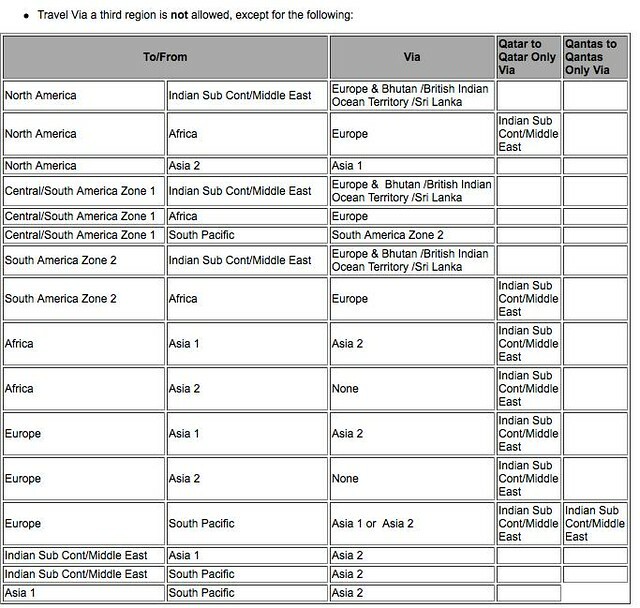 If I booked PHL-DOH-SIN, but then saw JFK-MAD-DXB-HKG-SIN had availability, could I change for free? What about if I booked PHL-DOH-SIN, but then saw JFK-NRT-SIN had availability? Thanks. So if I redeem two awards, I'm set on that routing with no option to change (barring something like IRROPS)? Can anyone recommend a nice place to travel to for four people using 200k miles? Excluding the Middle East and Indian subcontinent. I won them in a sweepstakes and would like to take my parents on a trip somewhere. Some agents will give you a hard time. Some just input your itinerary as asked. And some routings will trigger a mileage increase. I put the the last two legs on hold. Then called back a few times to add flights and each time it priced out the same. Try it out and see what happens. You cannot change the origin or destination airport of either award. * You can, however, change the routing of each individual award. * The exception to this rule is that you can change the origin or destination on an award by dropping beginning and/or ending segment(s) as long as you do not change the award's country of origin. So, if you start with PHL-DOH, you can change the routing on that award to PHL-MIA-DOH, and then you can drop the PHL-MIA segment, and end up with MIA-DOH. No Seats available on CX out of Bkk due to Chinese New Year. Can I route a oneway AA F award via Kul to Hkg then onwards? Technically I'd be backtracking slightly-anyone done this before? Thanks. As you're looking for a oneworld and partner award, I'll go ahead and merge this question into the extant thread on that topic. I have an itinerary that goes YYZ-JFK-LAX-MEL-SYD-AKL, my travel plans have changed since then and I want to cancel/redeposit. Only thing is the YYZ-JFK segment has been downgraded to Economy from Business since I've booked it. Is that a reasonable ground to ask for a free redeposit even though it's a insignificant flight when the whole itinerary is considered? It should be sufficient grounds if AA has changed the carrier, as from AA mainline to a regional carrier. The U.S. Department of Transportation has offered carriers some 'guidance' on that. So, am I to understand that if I now have LAX-HKG on CX using AA miles, but can't get SMF-LAX now due to no availability, I can't add that leg later without cancelling the LAX-HKG and starting all over again? You would not necessarily have to cancel the LAX-HKG award (and hope that the award seat returns to award inventory). But you would have to pay the $150 change fee to add the SMF-LAX SAAver segment to your existing award itinerary. As an alternative, you could just redeem for an additional award for SMF-LAX (12.5K AA miles or 4.5K BA Avios), or just purchase that leg for cash.